The Box is a wonderfully elegant and stylised piece of furniture indeed. But what is the Box? Is it a wall mirror, a shoe rack, a handy set of shelves or a CD/DVD rack? The truth is- it is not just one of these things, it is all of them! The brainchild of designer Luciano Bertoncini, the Box can be whatever you want it to be. Slim, trim and sleek, with a depth of just 20 cms, this cabinet is highly portable and can be fitted into even the smallest corner or crevice of your house. It is an incredibly versatile piece of furniture and can be tailored to cater to your exact needs. Have too many shoes and no place to store them? Fix the shelves obliquely and the Box becomes a rack that can hold up to 18 pairs of shoes. If you have a music or movie collection that you’re proud of and would like them to be nicely arranged and displayed, fix the shelves horizontally to turn the cabinet into a convenient DVD or CD rack. Alternately, you can just use it as a set of shelves to store small items and knick-knacks in. 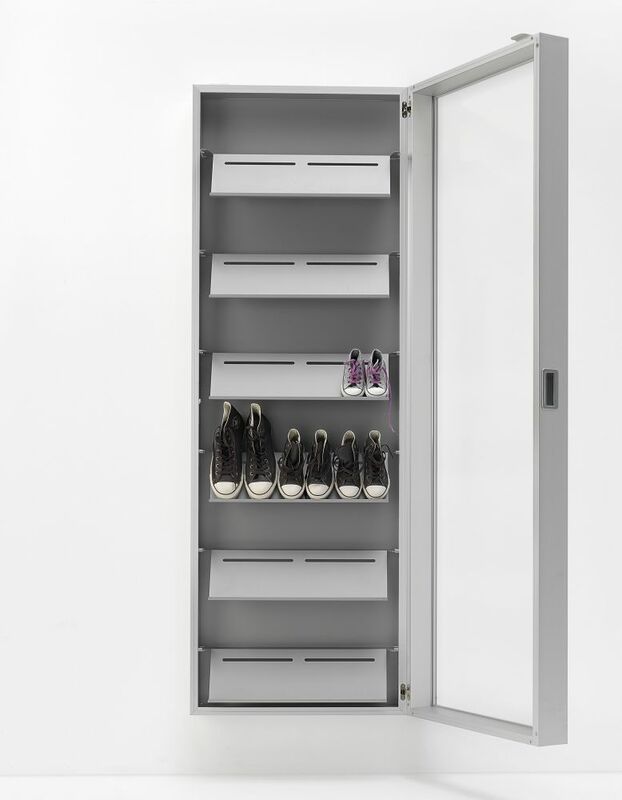 For a little bit of everything, go for the version of the Box that has a shelf on top, a hanger bracket in the middle that comes with three spiral stainless steel hangers, and a rack at the bottom where you can keep a few pairs of shoes. And to top it all off, the door of the cabinet has a full length mirror as well! It is elegant enough to be used in homes, yet sleek enough to be installed in offices. Its structure, in anodised aluminium or white lacquer, can be mounted in two different directions to provide a Rh or Lh door opening. The reduced depth of Box (20cm only) does not allow it to contain shoes with very high heels and platform heels. On request, without a surcharge, the shoe rack shelves (oblique) can be replaced with accessory shelves (ﬂat) or vice versa.